Brilliant piece… It’s this time of local reporting that is vital for our generation to understand what potential options there are for our future here. An international airport doesn’t seem to make much sense in terms of ultimate convenience when we are sandwiched between two large international hubs within an hour each way (Buffalo and Toronto). All anyone seems to talk about wanting is GO transport to Toronto (train). 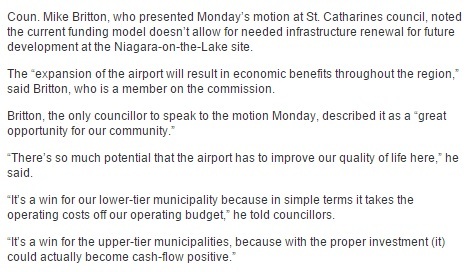 That ultimately improves our access to the Toronto airport in addition to everything else from the city. So would that be the better option you are referring to? I think it makes more sense to focus our “ask” for funding on projects that both help Niagara and are likely to receive funding. I think GO is one of those projects (and in fairness to Chair Caslin, one he himself noted.) Because, it isn’t just a simple additional line in an email to the Federal and Provincial government to solicit funds; it’s staff time and resources, it’s consultation reports and community engagement. Those things should be focused on worthwhile projects like GO.